Community Supported Agriculture (CSA) is a partnership between our farm (BurraBee Farm) and you, so that together we can build a sustainable local food system. CSA is an alternative, locally based economic model of agriculture and food distribution for small scale producers. It provides our small farm with the opportunity to come together with the community and build a sustainable model of food supply. As a BurraBee Farm CSA member, you have the opportunity to get to know your farmer and the source of your food. BurraBee Farm offers "shares" in the farm's seasonal vegetables. You will be part of a healthy and strong local food system, and hopefully get to know other BurraBee Farm members along the way. You receive each week a selection of delicious seasonal vegetables. We use organic practices that feed our soil and improve our farms ecosystem so that we can grow nutrient dense vegetables each season. When you join BurraBee Farm's CSA membership, you enter into a partnership with the farm, and share the bounty and risks associated with each season. BurraBee Farm CSA membes can feel confident that they are supporting their local food economy, that you are voting on the importance of local food and becoming part of a healthy heart filled BurraBee Farm private community. We aim to provide you with a variety of fresh vegetables. We grow heirloom vegetables, some that you will recognise and others you may not, but we are sure you will love. For a list of vegetables we grow annually click here. We pack your weekly pickings in wooden crates or large paper bags. We use minimal packaging, and only use bags or items that can either be recycled, re-used or composted. We use recycled elastic around those larger veges to keep them together. You can choose to receive your weekly delivery in our homemade box or in large brown paper bag. The homemade crates will be alternated throughout the seasonal CSA. Each week you will need to provide the previous weeks box for our collection. If you receive your vegetables in a brown paper bag, we encourage you to compost the bags, or if you prefer we are very happy for you to give the bags back to us and we'll turn them through our compost. If we provide food in glass or cardboard, we encourage you to either reuse or we are very happy to take the containers back each week. Now for your weekly share! We offer weekly membership for a family of one, two or four. If you would like an alternative please contact us to discuss (orders@BurraBeeFarm.com.au) Your membership will include everything that is ready to be picked and eaten that week. We aim to grow about 8-12 different types of vegetables. It's important to remember however that we are governed by Mother Nature. Vegetables, eggs and honey are seasonal. This includes your weekly share of seasonal vegetables. Some weeks you will also receive fresh eggs, honey if the season is right. We'll try to change the vegetables each week so you don't get bored but if we can't, why not learn the art of preserving, fermenting, or freeze your share for later in the season. Your CSA membership supports a fair, safe and transparent food system. Before joining our CSA, we ask that our members read and commit to the following statements. This is the Farm Policy, and it is what keeps our CSA running smoothly, both for our members and the farm. I understand that I am committing to this share’s growing and production season at BurraBee Farm and will respect the parameters of being a CSA member. I understand that BurraBee Farmers and the farm will do their best to provide a season’s worth of fresh food. I understand that I am sharing in the risks and challenges inherent to farming and that quantities and the timing of my share of the harvest may be affected by adverse weather events, for the length of my share. I understand that BurraBee Farm's CSA is grown sustainably, locally, and ethically. Because of this, my food may contain a bug or two. I understand that to promote storage and longevity, BurraBee farm does minimal washing of my vegetables prior to delivery. I will need to wash and inspect my vegetables before eating. I understand that it is my responsibility to ensure I am available for delivery of my fresh vegetables each week. If I am unavailable I will contact BurraBee Farm (orders@burrabeefarm.com.au) and let the know an alternative location or where they should leave my weekly box. I understand that email is the primary method of communication from the farm because mobile reception is sporadic. I agree to open and read emails from BurraBee farm. 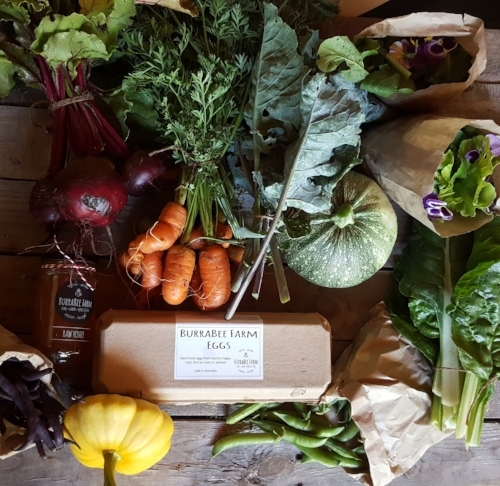 I understand that BurraBee Farm have made a commitment to growing nutrient dense vegetables just for me during the season, and that if I am away for more than two weeks I will make alternative arrangements to share my weekly vegetable box with family or friends. When I am away on holidays I will make sure I let BurraBee Farm know and arrange alternative weeks within the season for my extra veges. I understand that the success of the membership and BurraBee Farm depends on my continued commitment to support the farm throughout the seasonal growing period. Because of this, I understand that no refunds will be provided for shares. Your membership helps strengthen our community by supporting our local farm. You'll get to know us and our farm, along with the our growing season. We encourage discussions and chats via BurraBee Farm's Private Facebook Group, and at anytime Andrew and/or Vikki. Fresh seasonal vegetables, grown locally just for you! Why a CSA membership is important to us? When you become a CSA member, the money from your membership helps us to plan for the season, buy seeds, repair equipment and pay our wage. We are passionate about growing and sharing local food. Your CSA membership supports a fair, safe and transparent food system. You can't beat fresh local vegetables straight from our paddock to your plate. We can't also pick on the day we delivery due to time constraints but we pick in less than 48 hours of you receiving your share. We pick vegetables early in the day when they are at their freshest. They packed and then stored in our coolroom to keep their freshness for your delivery or collection. A CSA membership allows you to be creative with fresh local vegetables. We've found our regular members eat more vegetables, and encourage healthy eating habits to those around them. We've found children love to pick through your vegetable box, and soon get to know the range of vegetables available! If we have a recipe we think you'll enjoy, we will share it with you. We will let you know each week what will be in the box so that you can plan your weekly meals. We invite you to our exclusive BurraBee Farm Facebook group, where you can share your recipes and ideas with other members, or ask us questions about the vegetables. We hope you will become a member of our CSA. Your membership helps to ensure that our farm remains viable and becomes an important part of the CBR regional food community. You are helping to contribute to lowering fossil fuel use by eating locally, and helping up be responsible stewards of the land and water.